Ajji means Grandmother in the South Indian Language Kannada. 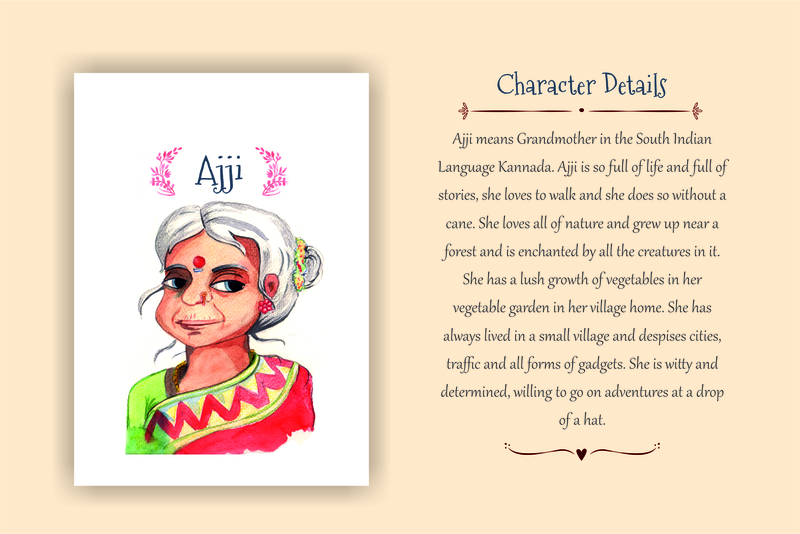 Ajji is so full of life and full of stories, she loves to walk and she does so without a cane. She loves all of nature and grew up near a forest and is enchanted by all the creatures in it. She has a lush growth of vegetables in her vegetable garden in her village home. She has always lived in a small village and despises cities, traffic and all forms of gadgets. She is witty and determined, willing to go on adventures at a drop of a hat. 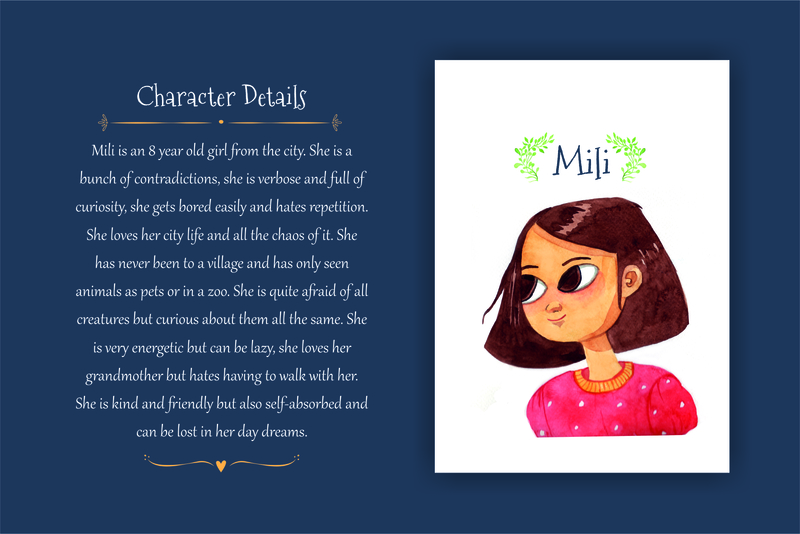 Mili is an 8 year old girl from the city. She is a bunch of contradictions, she is verbose and full of curiosity, she gets bored easily and hates repetition. She loves her city life and all the chaos of it. She has never been to a village and has only seen animals as pets or in a zoo. She is quite afraid of all creatures but curious about them all the same. She is very energetic but can be lazy, she loves her grandmother but hates having to walk with her. She is kind and friendly but also self-absorbed and can be lost in her day dreams. 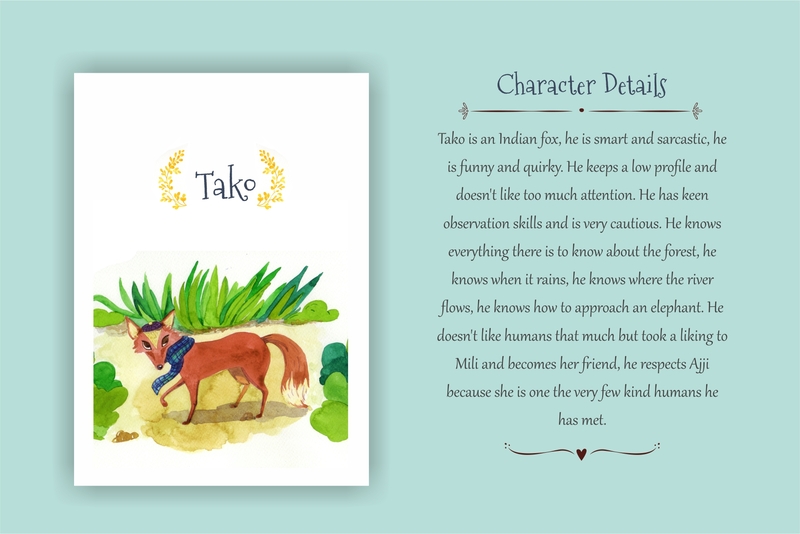 Tako is an Indian fox, he is smart and sarcastic, he is funny and quirky. He keeps a low profile and doesn’t like too much attention. He has keen observation skills and is very cautious. He knows everything there is to know about the forest, he knows when it rains, he knows where the river flows, he knows how to approach an elephant. He doesn’t like humans that much but took a liking to Mili and becomes her friend, he respects Ajji because she is one the very few kind humans he has met.